In accordance with the rapidly growing global population, the pea starch market has developed a wide range of consumer base in the food & beverage, pharmaceutical and many other end-user segments, due to better performance and health qualities as compared to other starch sources. Pea starch provides a gluten free, non-GMO (genetically modified organism) source of amylose with improved gelling and thickening properties, making them a valuable ingredient in various food applications. Low water binding, short structure and excellent film building properties have influenced the growth of the pea starch market from fast-moving food items like noodles, pasta, confectioneries and potato products. Augmented demand for such consumables, combined with the advancement in encapsulation technologies and tablet manufacturing processes achieved by the pharmaceutical industry will greatly propagate the global pea starch market, which garnered remunerations of more than USD 165 million in 2017. With expanding challenges in the healthcare segment, the demand for pharmaceuticals has been rising astonishingly fast, driving pharma companies into high gears to discover and deliver efficient drugs in a convenient manner. The pea starch market caters extensively to the pharmaceutical drug manufacturing sector, for enhancing the controlled release of medicaments held in tablets and capsules. According to medical experts, the most preferred form of dosage are tablets that disintegrate quickly and release the ingredients in the gastrointestinal tract. In recent times, not only quick-dissolving tablets that are to be swallowed but also tablets designed for disintegrating in the mouth are gaining traction among users. Subsequently, chemically altered fast-disintegrating ingredients, also called as superdisintegrants have been engineered to improve the breakdown properties of drugs, resulting in an alternative revenue source for the pea starch industry. Although the pharmaceuticals end-user segment contributed only 5% toward the overall pea starch market earnings in 2017, it also an enormous potential for proliferation through innovative research into drug delivery systems. For instance, studies pertaining to the use of pregelatinized hydroxypropyl pea starch as a superdisintegrants in orodispersible tablets suggested that the modified pea starch can be a suitable matrix forming material for orally delivered drugs. Separately, Roquette’s LYCOAT® RS780 was tested and compared with starches from corn and potato, after which it was established that capsules made with pea starch as the film former material had higher elasticity and burst strength. An industry reports estimated that by 2021 itself, the worldwide expenses on drugs could reach USD 1.5 trillion, indicating an imminent propulsion to the demand for pea starch industry products. 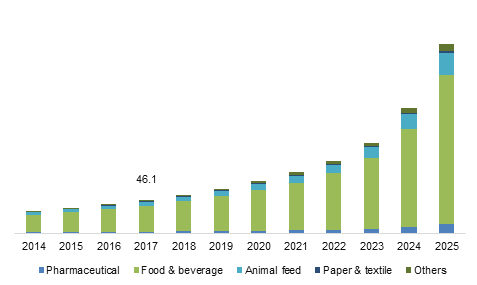 Several other lucrative industry verticals are expected to shape the pea starch market dynamics significantly over the coming years. Low glycemic index associated with peas, along with the neutral odor and taste of pea starch has made it popular among canned food and processed meat producers, in the form of coatings and for ensuring good texture. End users from the food and beverages segment are witnessing increased availability of tasty and nutritious food, being packed in cans or boxes, like soup, fish, poultry, among others. This has emerged from the evolving lifestyle of people which has necessitated the development of ready-to-eat food solutions which require less time to make and consume. A key factor boosting the pea starch industry expansion is that it is ideal for people having allergies to certain other ingredients and also for vegan consumers as it does not contain gluten. Being a rich source of clean and sustainable energy, pea starch is also an apt ingredient for producing health beverages for athletes as well as for general use, as it does not cause digestive issues like other maltodextrin-based supplements. The pea starch market is comprised of novel companies like PURIS and X1 Nutrition that utilize pea starch and proteins in health drink options that can replace the milk or soy based drinks. Benefits such as improved endurance, long lasting energy, no sugar high and reduced bloating have encouraged the acceptance of pea starch in food or beverage products for athletes. Incidentally, a large number of recipes have cropped up promoting the use of natural constituents for preparing food at home, with the advent of internet providing a platform for spreading awareness about healthy cooking and eating. All in all, the pea starch market for the food and beverages sector is projected to exhibit a remarkable 24% CAGR from 2018 to 2025 owing to increased adoption of healthier, natural ingredients worldwide.